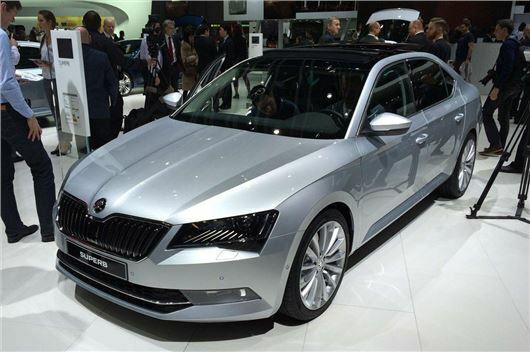 Skoda has revealed details of its all-new flagship Superb ahead of its public debut at the Geneva Motor Show. The new model is due in the UK from Summer and will cost from just under £19,000. The classy, unfussily styled new model offers more interior space than its already capacious predecessor thanks to a longer wheelbase. Family styling cues from other Skoda models are present and correct, including recognisable tail lights and an emphasis on horizontal lines to accentuate width. The engine range features two petrol engines – a 1.4-litre with 150PS, plus a 2.0-litre with 280PS and all-wheel drive. UK models will have a predominantly diesel focus however. There are two diesel engines – a 1.6-litre and a 2.0-litre, but with three power outputs on offer. The cleanest 1.6-litre TDI produces as little as 96g/km of CO2 in manual Greenline form, which equates to 68.3mpg. Though not quite as frugal, the mainstay of the range will be the 2.0-litre available with 120PS or 190PS power outputs, though final emissions and economy figures for these are to be confirmed. The Superb adopts much of the latest Volkswagen Groupe tech including lane keep assistance, brake assistance, blind spot warning and traffic sign recognition, plus it comes with ‘Simply Clever’ touches like a bottle holder that allows 500ml bottles to be opened with one hand. Other touches include 12v and USB sockets for rear seat passengers, plus familiar things from other Skoda models like a clip for pay and display tickets and an ice scraper in the fuel filler cap. UK prices and specifications are to be confirmed but expect to pay just over £20,000 for the Ford Mondeo rival, which will arrive in the UK in later Summer. Surely a limo should be accentuating length rather than width? It's a shame it appears to have less design of it's own than the old Superb, clearly they were aiming for a generic Large Skoda look rather than anything specific which is always a shame. Also, 120PS and 190PS is an interesting choice of power outputs (the 1.6 presumably being 90/105PS). The old superb and most rivals have their best selling models around 140-150PS.